A few months ago I made an experimental background using several masks and stencils (most of them homemade with some of my dies) and sponging with a variety of inks. I wasn't very happy with the result but, unwilling to consign it to the bin, was waiting for the right opportunity to use it. So here we are! I'll confess though, that in order to use the most subtle (!!) part of the pattern but in the location I wanted it, I cut a circle from the background (hidden behind the top panel) and placed it under the bauble. 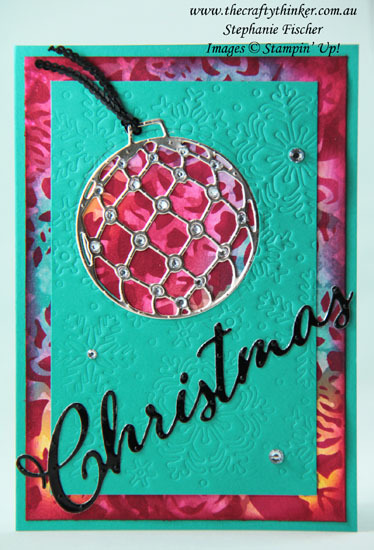 I cut a circle in the top panel of Bermuda Bay with one of the Layering Circles Framelits and then embossed with the Blizzard Thinlits die, using the Embossing Mats. The Detailed Bauble is cut from Champagne Foil Sheet and decorated with rhinestones. The word "Christmas" from the Merry Christmas Thinlits is cut from Black Foil Sheet and I added some Black Mini Sequin Trim to the top of the Bauble.